Chief Minister Shivraj Singh Chouhan said his government was committed to protecting journalists. “A probe has been ordered. Whoever is guilty will be punished,’’ he said. A local television channel stringer, who exposed illegal mining and had even sought police protection after getting threats in the wake of a sting operation against a senior police officer, was run over by a truck Monday in Bhind town in Madhya Pradesh. 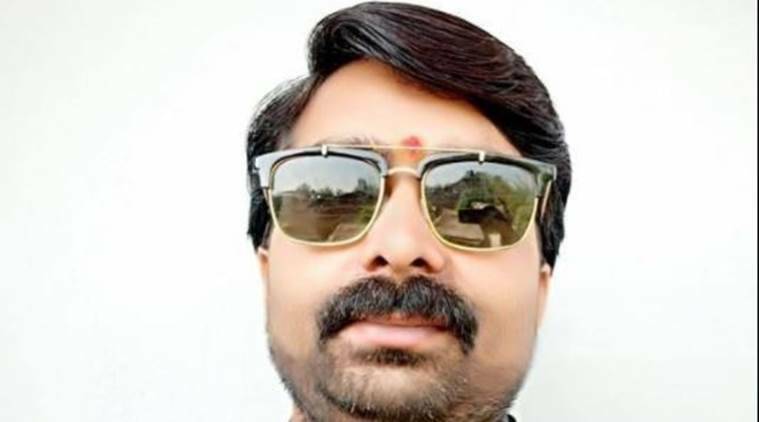 Sandeep Sharma (36), a stringer for the Bhopal-based News World TV channel, was riding a two-wheeler when a truck knocked him down near the Kotwali Police Station around 9 am on Monday. The driver of the truck, Ranbir Yadav, was arrested later on Monday. Police have registered a case of culpable homicide not amounting to murder and formed a special investigation team (SIT) after family members and local journalists alleged that Sharma was murdered because he had exposed the collusion between the sand mafia and police. Bhind SP Prashant Khare said more charges could be added depending on the outcome of the SIT probe. He also said the truck was owned by a man who deals in bricks. A purported video of the incident showed the truck swerve towards the bike before knocking it down but the police said it was too early to determine if the accident was deliberate and if there was any foul play. DIG (Chambal) Sudhir Lad told The Indian Express that from the video footage and after preliminary questioning of the driver it was a case of accident. The driver claimed that he did not know how the accident happened. “Though it appears to be an accidental death, we will carry out a comprehensive probe if there is one per cent possibility of foul play,” he said. Sharma and Vikas Purohit, the local bureau chief of the channel, had conducted a sting operation against a sub-divisional police officer (SDPO) Indraveer Singh Bhadoriya which purportedly showed him asking for money to allow vehicles carrying illegally mined sand from the Chambal River to pass without checks. According to his application for police protection, Sharma and his family feared the SDPO could implicate the journalist in some criminal case or get him eliminated in a road accident. The application demanded the SDPO’s immediate transfer outside the Chambal division and probe allegations against him. While seeking police protection, the application said the SDPO should be held responsible if something untoward happens to him. Asked about the sting operation, Purohit said that he had waited outside the office when Sharma, posing as a sand miner, struck a deal with Bhadoria. The police officer asked Sharma to give the money to a junior police officer, who the duo filmed pocketing the money. The channel ran the story without the SDPO’s version but included the version of Ater Congress MLA Hemant Katare. After the channel ran the story around Diwali last year, Sharma and his bureau chief sought police protection and alleged their lives were in danger and that they had received threatening phone calls. Bhind SP Prashant Khare acknowledged that Sharma had expressed fears that he could be eliminated. However, no protection was provided to Sharma, who has two children aged 11 and eight. Channel chief Rizwan Ahmed Siddique said he received calls describing the stringers as alleged blackmailers. “I asked for proof of their blackmailing activities but never got any. I cannot say anything with certainty about the accident but the authorities did not act on the sting or on the threat expressed by the journalists,’’ he said. Asked if the stringers sent more stories about illegal sand mining after the sting, he said he could not recall any offhand. SDPO Bhadoriya could not be contacted for comment. No action was taken against the SDPO after the sting operation was telecast in July 2017, but he was transferred a couple of months later for acting in haste against the MLA Katare. He had filed a case against Katare, the son of former leader of the opposition Satyadev Katare, and a challan without seeking approval from his seniors. A local court had quashed the charges and criticised police for shoddy work. Congress chief whip in the Lok Sabha, Jyotiraditya Scindia and MP Congress Leader of the Opposition Ajay Singh said the case should be handed over to the CBI. The duo had conducted an earlier sting operation a few months ago against another SDPO when they worked for a different news channel. That officer was transferred but not because of the sting. Purohit said the sting was not important enough. A case for obstructing government officials on duty was lodged against Sharma at the Kotwali police station after he allegedly manhandled a police officer. Purohit claimed Sharma had gone to the police station to file an FIR alleging assault but instead was booked by police. He said the case was proof that police were acting at the behest of the SDPO. Purohit alleged that when the police recovered the truck involved in the incident, its wheels were being changed to destroy evidence like blood stains. In his application seeking police protection, Sharma identified himself as a “clean journalist”. It said SDPO Avnish Bansal nursed a grievance against him after a sting operation about his alleged indecent behaviour but he was transferred before he (SDPO) could do anything. The letter then describes the sting against SDPO Indraveer Singh Bhadoriya on July 27, 2017. Sharma said he gave Rs 12,500 to jawan Munni Lal Yadav but did not give the second installment of Rs 10,000. “The SDPO realized within two days that the applicant is a journalist covering Chambal sanctuary where he extorts money after letting go vehicles carrying illegally mined sand,” said the letter. The complaint also alleged that every time he (Bhadoriya) moves out of town for coverage “anti-social elements’’ hover around him. The application also accused the SDPO of being hand in glove with those involved in illegal mining and have political backing.